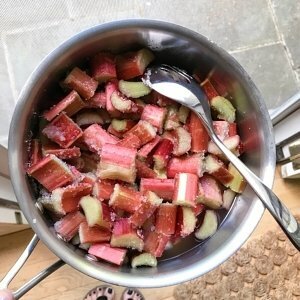 Rhubarb is a tart vegetable (even though we treat it like a fruit) and is often considered one of the first harbingers of spring…. 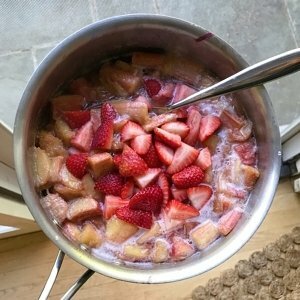 Growing up my Great-Grandfather grew tons of rhubarb and gave it all to my mother who turned it into the most amazing Strawberry Rhubarb Pie, Rhubarb Coffee Cake, and Strawberry Rhubarb Sauce among other yummy treats. 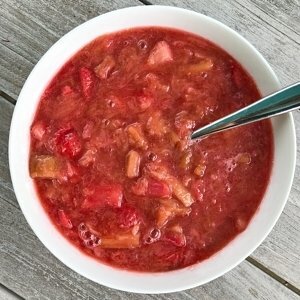 Strawberry Rhubarb sauce is really easy to make and has so many uses. My mom and I like it plain as is for dessert. My Grandmother used to eat it plain for breakfast. Other times, we’ve served it over vanilla ice cream. It is equally yummy served with yogurt or vanilla chia pudding. So make a batch and see how you like it…. the possibilities are endless! Recipe from my Mom, it's adapted from the 1963 Good Housekeeping Cook Book... so it's an oldie but a goodie! Strawberry Rhubarb Sauce is delicious as is or served with yogurt or chia pudding for breakfast, over vanilla ice cream for dessert or any number of possibilities! Corn starch as need to thicken. I didn't need to add this time but have added a 1 tbsp or so as needed. In saucepan, combine first 4 ingredients & simmer for 10 min or until tender, stirring gently periodically.